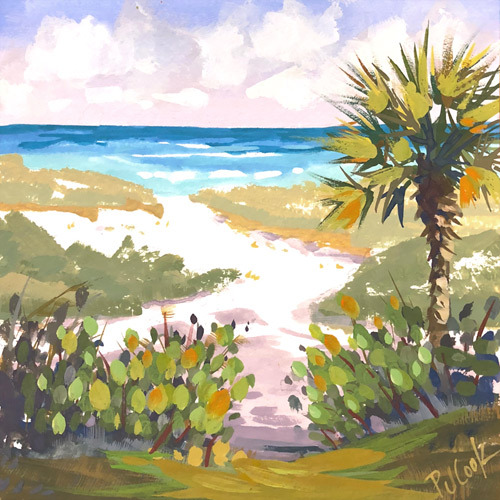 This Beach Path Destination is an original painting by PJ Cook. Sold unframed with free shipping. A one of a kind painting from Southeastern Florida. Featuring a palm tree and sand dunes with a sandy path to the aqua colored ocean. One of the many beach paths to the Atlantic Ocean along the Florida coast. This one is in Lauderdale by the Sea. The lush foliage in a variety of greens was fun to paint. This can easily be framed in a ready-made picture frame. Beach Path Destination, 6×6 gouache on paper, ©2018 PJ Cook.